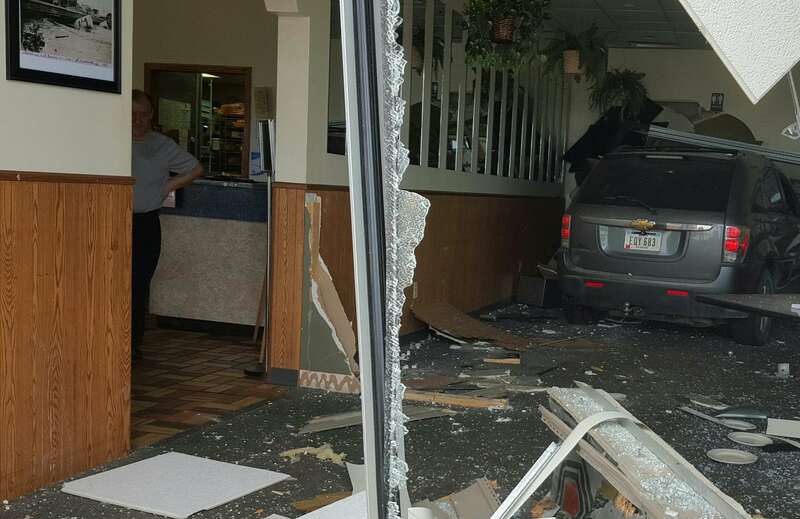 The Sunset Family Restaurant in Manchester is cleaning up after a vehicle crashed into their building late Monday afternoon. Owner Penka Ismaili tells KMCH it was a scary experience. Penka says that’s when he saw a vehicle sitting in the restaurant’s dining room. Manchester Police initially believed a vehicle malfunction – specifically a stuck accelerator – may have led to the crash. They have not released further details about the crash, including the name of the driver. Police say he was not seriously hurt in the crash – just some scrapes and bruises. But Penka says the driver is a regular customer and has apologized for what happened. The restaurant’s owners, landlord, volunteers and even some of its regular customers got right to work Tuesday morning cleaning up the damage (photos below). They’re hoping to re-open in two to three weeks.